Charmin Basic Toilet Paper is two times stronger than the leading competitive brand when wet. It is the only bath tissue with Duraflex texture for a gentle strength that you will appreciate. This toilet paper roll is durable and long-lasting. 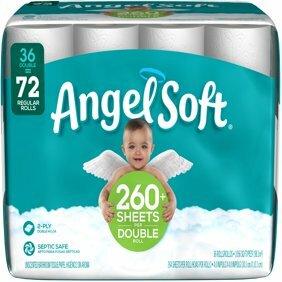 Each roll is made up of 264 one-ply sheets and each package contains four double rolls, providing you with plenty to use. To avoid danger of suffocation. Keep this bag away from babies and children. I recently gave a bridal shower to my daughter and played a game where the girls were divided into two groups and a one girl was chosen as a model....they had to design a wedding gown with veil and the bouquet out of bathroom tissue...I needed a tissue that would withstand the tugging and pulling and i chose charmin for its strength...everyone was amazed at how charmin allow flexibilie to make such a dress... The bride to be chose the winning dress and a nice gift was given to the group...Thank you charmin ..you are priceless..(If you would like to see the wedding dresses let me know) and the girls did ask what brand of bathroom tissue was it??? Hope I got some customer for you!!! I love this type of Charmin because it is basic. I don't want any perfumes or additives in my toilet paper because I am allergic to them. Strong and absorbent without all the fancy stuff. We're so glad you appreciate your Charmin because we definitely appreciate you! Thanks for the review and for choosing Charmin! You cant go wrong with the Charmin Basic. It's stong but not at all rough. It's soft enough but will not leave ANYTHING behind. Plus, it's a great price. Thanks for the support! We appreciate you took the time to review us! I am the mother of 5 girls so tissue goes pretty fast in my home. Charmin Basic give us the best bang for our buck! It's not to soft, but it doesn't feel like we're using notebook paper either, and a roll will last much longer than any of the other brands that we've used. I used northern tissue for years, then my bf said to buy Charmin ultra soft, so I did and admitted to him Charmin was better then I tried the basic and this is the most god awful paper I've ever tried. I'm wondering what I can do with the other 10 rolls I'd be embarrassed to even give it away. not kidding!